In their book, The Physiography of Southern Ontario, L.J. Chapman and D.F. Putnam recount the amusing story of a 19th century land-surveyor in Ontario. This surveyor was staking out county lines and dividing farm lots in an area that had very poor drainage. Mosquito-infested swamps and bogs covered much of the landscape. The work was exhausting and the surveyor grumbled about the harsh conditions as he slogged his way through the mire. He reckoned that it was only appropriate that such mean and miserable terrain be given a name that reflected its severity. Being a Roman Catholic, and obviously one with strong sentiments, the surveyor commemorated in a rather unique way the leading figures of the Protestant Reformation. That’s why today you will find in south-central Ontario the townships of East and West Luther, and Melancthon. The surveyor must have known his history well—though his judge of character was somewhat flawed—because Philip Melanchthon is not a familiar figure outside informed Protestant circles. Melanchthon has been referred to as “the quiet Reformer” and “Wittenberg’s other Reformer” (by Clyde Manschreck and Timothy Wengert respectively). These labels allude to Melanchthon’s friend and co-worker, the brash and bombastic—and much better known—Martin Luther. His lack of popular recognition aside, Melanchthon was crucial to the realization of the Reformation, and he is often considered its spokesman and one of its principal theologians. Melanchthon was born in south-western Germany on the cusp of the 16th century. He was a child prodigy, studying at the University of Heidelberg when he was only twelve years old. Completing his bachelor’s degree two years later, he then undertook a Master of Arts from the University of Tübingen. It was at Tübingen where the young Philip immersed himself in the study of classical languages, philosophy, and methods of discourse, as well as other interests like astronomy and mathematics. Melanchthon loved the humanities and considered them a gift from God. He would later use them to great effect in helping articulate God’s greatest gift, the Gospel of Jesus Christ. But first life would take him to the University of Wittenberg in Saxony where, in 1518 at the age of twenty-one, he took up a professorship in classical Greek. God proved to have bigger plans for Melanchthon than just teaching the classics, however. It was at Wittenberg that the young humanist scholar would develop into the renowned theologian of the Reformation. Hearing Luther preach the Gospel, Melanchthon was convicted and soon joined the evangelical movement. He took up theological studies in earnest and soon prepared a ground-breaking work; published in 1521 and based on St. Paul’s epistle to the Romans, Melanchthon’s Loci communes theologici (Common Places in Theology) was the first evangelical systematic theology. Melanchthon also had a vision for reforming education. He recognized that the proper teaching of Scripture was essential to conveying with certainty the Christian faith; only this type of teaching could aid in reforming the church of its misleading and erroneous doctrine and practices. Melanchthon believed that using education to reform the church served a fundamentally practical purpose as well: it improved the lives of the common people. Under his leadership, university studies were enhanced and public schools were established. Melanchthon’s program of egalitarian education in Germany had a profound influence on a later Methodist minister and educator in Canada by the name of Egerton Ryerson. Ryerson revolutionized education in this country when he adopted Melanchthon’s public school system for Ontario (then Upper Canada). Ironically, Ryerson’s initiatives were being implemented around the same time a certain surveyor was mired in the muck of rural Ontario. Still, as influential as Melanchthon’s educational reforms were, the height of Melanchthon’s career, both as a theologian and a reformer, would come with his crafting of what some consider the most important Christian confession of the last five-hundred years. In the late Medieval Era, the religious lives of common people were filled with fear and their consciences gripped with guilt. The Church in Rome, instead of proclaiming God’s mercy, emphasized human merit as the way to God. The people struggled with their personal standing before God, and attempted to alleviate their sinfulness, guilt, and anxiety through their own works. Melanchthon knew that such teaching only drives already terrified consciences to doubt and despair. For who could ever know whether one’s morality, charity, or piety had earned enough merit? Melanchthon saw that consciences, plagued with guilt and clouded with confusion and uncertainty, needed consolation and clear teaching regarding one’s standing before God. Believers needed to be convinced that God’s forgiveness and saving grace was based on Christ’s work, not their own. So Melanchthon set about to address the spiritual welfare of the common folk by proclaiming the true and certain message of God’s promises of mercy. He did this with the Augsburg Confession prepared in 1530 and in the Apology (Defense) to the Augsburg Confession published the following year. These documents affirm the saving work of Jesus Christ and our justification by faith alone. Our Lutheran tradition has historically referred to justification as the doctrine by which the church stands or falls, but justification was also the teaching by which individual sinners stood in assurance of God’s love or fell away in fear. Melanchthon saw awesome power in the knowledge that we sinners are forgiven by God, not on account of our own merit, but rather on account of Christ. We are justified by God’s grace through faith alone. For Melanchthon this principle both magnified Christ and consoled consciences. 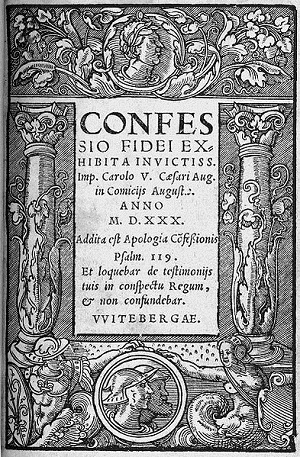 Both the Augsburg Confession and the Apology were later published in The Book of Concord, which remains the fundamental confessions of Lutheran doctrine and faith to this day. As a scholar, teacher, theologian, and reformer, Philip Melanchthon was many things but—contrary to the grumblings of a particular land surveyor—he was not a mean man. He cared deeply about people. Though he was even-tempered and restrained in his actions, he had intense heartfelt passions. Thought by others to be a man of conciliation and compassion, he considered himself an irenic soul. But when the occasion called for it, a strongly polemical side in Melanchthon could emerge (as in the Apology, where he defended the Augsburg Confession against its critics). But this only attests to the seriousness with which he regarded the Good News that we are justified by faith alone and not works. With all due respect to the Roman Catholic surveyor who had to slog through swamps while swatting mosquitoes, Melanchthon wasn’t mean; he was just extremely serious about teaching the truth of God’s promise of mercy. A gifted scholar and a brilliant theologian, Philip Melanchthon had few intellectual peers. Though small in stature (he was less than five feet tall), he stood as a giant figure during the Protestant Reformation. Melanchthon was not the most imposing figure; he was physically frail and afflicted with a speech impediment. But though weak in body, he was strong in mind and spirit. Melanchthon’s strength lay in his faith in Christ. And he sought to strengthen the faith of others by communicating God’s promises of forgiveness, justification, and reconciliation to them. Melanchthon’s tomb lies next to Martin Luther’s in the Schlosskirche in Wittenberg, Germany. Four thousand miles away in Ontario, Canada, the historical townships of Melancthon and Luther lie next to one another. The history behind how the townships were named may not seem quite fair, but in a unique way it reveals the impact Melanchthon had on the Protestant Reformation and the prominence he shared with Luther. Though Luther’s is the name most commonly associated with the Reformation today, Melanchthon’s theological and confessional contributions were crucial to the movement’s development. His work on justification in the Confession and the Apology testified, with clarity and certainty, to the Gospel message of God’s grace through Christ. Almost five hundred years later, the testimony of “Wittenberg’s other Reformer” continues to provide consolation, assuring countless people that we are reconciled to God by faith alone, not works, on account of Christ.